Meet Sam, a killer vegan with their own blog. 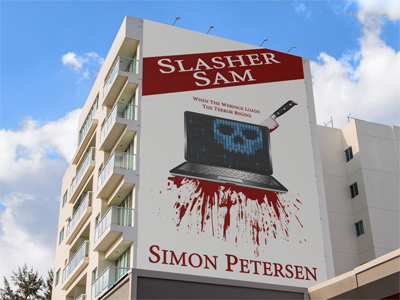 Dismayed that the slasher movie genre is currently deader than a Crystal Lake camper on Friday the 13th, Sam is bringing new life to the art form by ending the lives of mischievous campers, unruly party-goers, and anyone who breaks one of the fundamental rules of being in a slasher movie. And my name is Simon Petersen. I’m a long-time travel blogger here at Man vs World, a professional journalist, and, now, a published novelist. That’s right. I wrote a book! Crazier still, Darkwater Syndicate, an award-winning publishing company with a defence contractor’s name (their joke, not mine) agreed to publish it. And now you can pre-order it for Kindle from Amazon, or from Barnes & Noble, before its 31 March release date. So, if you’ve been a long-time reader of this travel blog, and you’ve always wondered what it’d be like if instead of travel I blogged about mayhem and murder, then this book is for you. 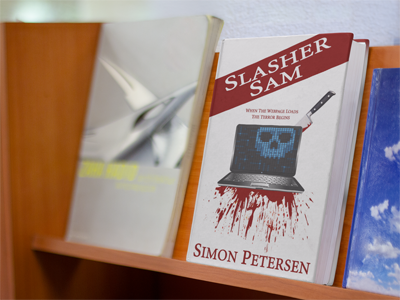 If not, I still think you should buy a copy of Slasher Sam ­– or the next blood-curdling scream you hear could very well be your own.